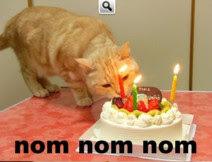 Aficionados of lolcats and the icanhascheezburger site will be familiar with cats’ (and other animals’) propensity to go “nom nom nom” and their love of nomming. This word is unknown to the OED, but the invaluable on-line Urban Dictionary tells us — at some length and with a lot of repetition — that a nom is the sound one makes when eating something, and that to nom is to eat. What, I wonder, could be the etymology of this term? a West African language (e.g. 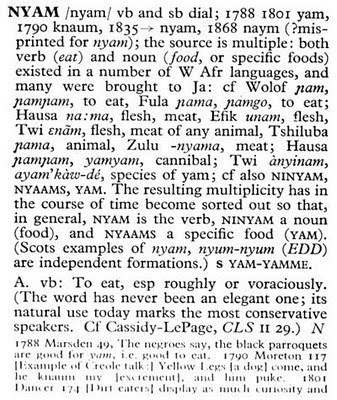 Wolof ɲam to eat or Fula ɲama to eat), although perhaps simply imitative. Here is the beginning of the more detailed treatment available in Cassidy & Le Page’s Dictionary of Jamaican English (CUP, second edition 1980). Although foreign-language a is mapped onto the TRAP vowel in British and Caribbean English, in AmE it could well be mapped onto the LOT vowel. (Compare BrE kebab kɪˈbæb, in AmE also kabob, from Arabic etc. kabāb.) The non-English initial palatal nasal ɲ might well have been replaced by the familiar n. Hence a source form ɲam might have become AmE nɑm, which would naturally be spelt nom. I haven’t got access here to a word list of Gullah (or indeed of AAVE) to check for n(y)am, n(y)om there, but perhaps one of my readers has. If found, that might clinch the matter. 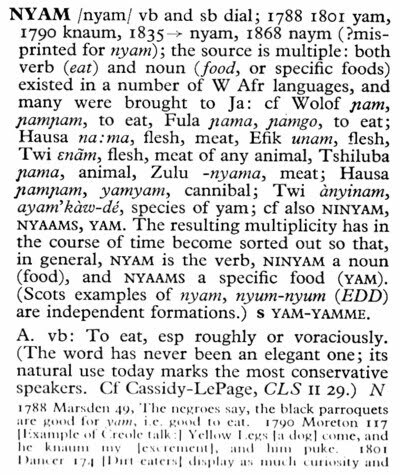 In short, I wonder if nom is a doublet of nyam and is thereby one of the rather few words of English taken from an African language. Or is it really “simply imitative”? I'm going with simply imitative based on equivalents in other languages - Slovak/Czech "mňam", Hungarian "nyam", Polish "niam" (there's even a recipie site niam.pl with the motto 'life is tasty') and so on. Supports the "imitative" hypothesis I'd say. "Namnam" isn't unusual in Norwegian either. And the usual Italian onomatopoeia is "gnam gnam". Compare also "ñam ñam" in Spanish. The French "miam-miam" is only slightly different. The story I heard was that it's from Cookie Monster's use of "om nom nom nom" while eating things - so, simple onomatopœia. 'Njam njam'(њам њам) in Serbian. In the 1968 film "The Party" Peter Sellers plays an out-of-work Indian actor in Hollywood who speaks Peter-Sellers-faux-Indian-English (harking back to Dr. Kabir's "Goodness gracious me" in the "Millionairess). When feeding a caged bird he repeats the phrase "birdy num num" or something similar. I have been told by people who grew up in India that "nam-nam" is Indian baby-talk for "eat". I always thought "nom" was the sound you made when your mouth was full of yummy food, and you were attempting to vocalize the "yum" sound at the same time you attempted to chew. Leave it to Professor Wells to inquire into the origins of a bit of "lolcat" silliness! I understood "Om [sic] nom nom" to have been introduced into wide circulation (wherever it may have originated) by the Cookie Monster. Here the master explains to an English interviewer how it is done. It seems to me that the interviewer says [nɒm], while Cookie Monster uses both [n] and [ɲ] as initial consonants and uses vowels ranging between [ɑ] and [ʌ]. Nyam nyam (냠냠) /njam njam/ in Korean. This was my immediate thought upon seeing the picture. Well, this post has finally pushed the Economist to link your blog. Congratulations! Like Franni, I remember 'num-nums' being pretty standard baby talk for food. I thought of it as a variant of 'yum.' And I too am older than the Cookie Monster. The spelling 'nom' seems recent to me. Just checked out the economist piece and want to reassure that the "Lafayette" who commented is nothing to do with me here at Lafayette, LA! I've heard both niam and mniam from native speakers of Polish, so it doesn't surprise me that much. But yes, niam is rather strange, considering the cognates in other West-Slavic languages. FYI, this Jabal-al Lughat post has some more examples of imitative / baby talk words for various bare necessities, including links to more detailed research. Definitely no connection between the Cookie Monster and the Italian onomatopoeia gnam gnam - the Zingarelli Italian dictionary dates it back to 1868! Yes! nam nam nam is also used in Pashto in the same context. Mothers are often seen saying this to thier little kids when they want them to eat some thing. In Iban, a Malayic language spoken in Borneo, ɳam ɳam means 'tasteless, insipid'; in Malay it has the usual cross-linguistic meaning. This is part of a larger process of semantic reversal in certain Iban words. As another example, Malay kampoŋ means 'cluster of buildings, village' > English compound in the same sense, but Iban kampoŋ means 'forest', the very opposite of a settled area. One is tempted to guess that this is a language game that became a permanent part of the language, as if an English-speaking village decided to speak nothing but Pig Latin from now on, and brought up their children speaking it. I'm sure nom is just echoic and similar words are surely in a whole slew of languages. I'm reminded also of Cantonese 飲 yám 'to drink'. 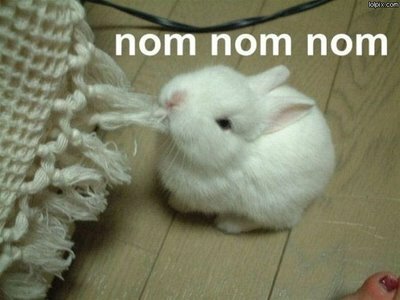 I believe that the word "nom" actually comes to us from Sesame Street. Any time the Cookie Monster grabs a cookie he devours and makes the following sounds... "Om Nom Nom Nom Nom"
Yum yum: These variants all mean "open up!". Nyam nyam occurs also in Slovene. Neighboring Austrians say ham ham (low back) . This is said to entice a baby to "open wIde" and nip a morsel. Also said when eyeing something delicious. The basis of all such phonations is the universal (?) gesture of opening wide the mouth and raising the lower jaw to nip or take a bite is the basis of all these as well as English yum yum... The forms with initial y reflect a gesture beginning with apex low, glottis simultaneously opening. The h-initial forms have high apex, preceded by opening the glottis. The nasal-initial forms have apex low and glottis open. Nasal quality is induced by lowering the velum and/or spreading the blade over the alveopalatal zone. Letters & segmental phonemes are fictions, albeit useful. If your Google chokes on this link then see on Google Slovenija for photo & text: njam njam - ham ham. This is fun: GNAM is the title of Pasta manufacturer BARILLA web site. The logo has a big capital G with a bite taken out at 10-11 o'clock. Like Apple computer logo. "Last October the City of Parma hosted the first International edition of GNAM, an event focusing on Gastronomy in Modern Art. GNAM needed a context of excellence in food culture, and the choice to locate GNAM in Parma and its territory in the heart of the Italian Food Valley has certainly been not casual. In this context, Academia Barilla, as the point of reference and most credible source for Italian gastronomy, couldn’t miss the opportunity to collaborate with the organizers to ensure the success and gastronomic relevance of the GNAM Festival." yum, yummy, yum-yum all seem well-established in English as baby-talk lexicon. The last is also a character in the Mikado--Yum-Yum, A Ward of Ko-Ko, which opera favors baby-talkish as pseudo-Japanese. Initial nasality, just syllabic /m/, is an expression of gustatorial delight, as in the decades-old slogan of Campbell's soups: mm-mm good... Perhaps we can add this root to the world language word for mother... In fact, maybe that is the ultimate etymology--mm mm good!